Leiden has often been called the most beautiful city of the Netherlands. This isn’t surprising, considering the rich city history that’s still visible everywhere in the charming city centre. When you take the large number of museums, the number of monuments and the thriving cultural climate into account, you will certainly agree that the city is well-deserving of its reputation. For more general information about Leiden, check the tourist information site. The city of Leiden has a rich history: around 1200 the settlement got its city rights from the count of Holland; Leiden was born. Thanks to the international textile industry Leiden became the biggest city of the county Holland in the 15th century. The Hooglandse church and Pieters church reflect the prosperity of this time. The textile trade gave Leiden an international character that is still present. In 1572 Leiden joined the Netherlands in the rebellion against the Spanish, and was besieged. After a period of grave hunger and sickness Leiden was almost conquered by the Spanish, however, October the 3rd 1574 the troops of Willem van Oranje, Prince of Orange, moved into the city. This day (Leidens Ontzet) is still celebrated every year with white bread, haring and local festivities. As thanks for the resistance of the city against the siege of the Spanish, Willem van Oranje founded the Leiden University on February the 8th of 1575. Leiden has 35 courtyards or ‘hofjes’ with almshouses around it. Hofjes were part of the social system in the middle-ages, meant for poor and old people. The houses are built close together and there’s a central commonly shared courtyard. The hofjes are idyllic places in the city center, were the noise of the city is shut out and time seems to stand still. 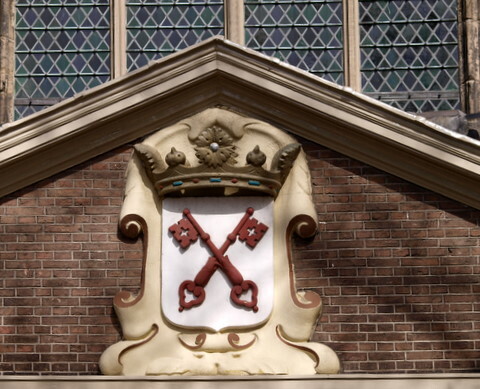 The coat of arms/crest of Leiden consists of 2 crossed keys; therefore Leiden is often referred to as “sleutelstad” (keytown) and you can find key references in many aspects of Leiden. The keys (“sleutels”) are the symbol of the patron saint of the city; Saint Petrus. This tradition dates from 1293, when signets with Petrus on it were frequently used on documents. 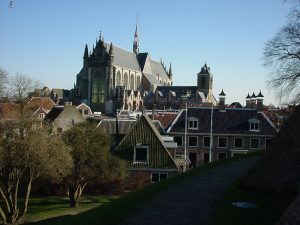 Leiden is a typical student city. 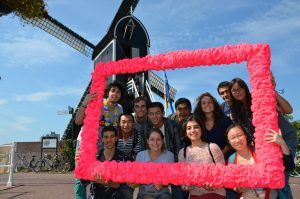 About a fifth of the Leiden population is between 18-24 years of age. 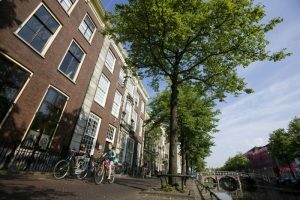 A lot of students move out of their parents place and look for their own accommodation in Leiden. You can find your own accomodation through organizations like SLS/DUWO or you could rent from a landlord. The University website for housing is this. Another Dutch website that is useful for finding a room is kamernet.nl. This website offers both rentals and sublets, especially subletting is a convenient way to find a temporary room.